My first memories of the stone were as a young girl visiting with the wife of my father’s friend. I marveled over the beautiful emerald cut Aqua around her neck as it carried my imagination to daydreams of mermaids and the sea. Of course, in the years that followed and my education, I’ve been exposed to many beautiful treasures since but I am always captured by the striking beauty of a clear aquamarine. There’s something so sophisticated and enchanting about it. From Latin, the name Aquamarine translates to “of the sea”. This is perfectly captured in the stones pale blue green coloring. Like Emeralds, Aquas are a color variety of the mineral Beryl. The more intense blue stones are the most valuable and are referred to as maxixe. Aqua can be found all over the world but countries like Madagascar and Brazil are most notable for it. For our designs, I would always love to incorporate more of this stone for it’s beautiful color. However, finding Aqua beads for our work is almost as challenging as finding the clearest high quality Aquas. They are not so easy to find and so that’s why in our pieces you see a spectrum of different tones of Aquamarine. Like many gemstones, there is much history and power associate with the stone. In ancient lore Aquas were said to be Mermaids' lost treasures and believed to protect sailors and offer safe passage. They also symbolized love and unity and were often given as a wedding gift. 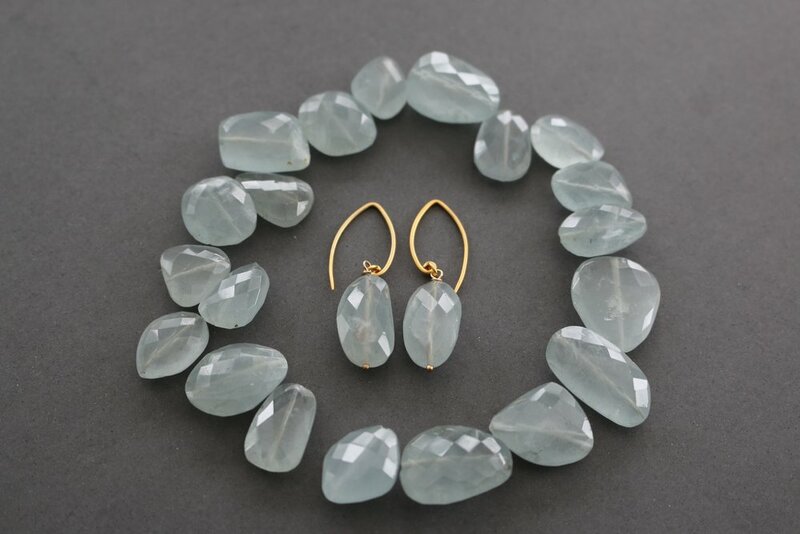 Today Aquamarine still remains a popular stone. It is the official birthstone for March and marks the 19th wedding anniversary. It is said to bring clarity and tranquility it’s wearers.